Summer has officially arrived. We are looking at temperatures in the 90s with triple-digit heat index. I can’t complain though… I have a cool house and plenty of time to read and write. I will finish A Piece of The World by the end of today. 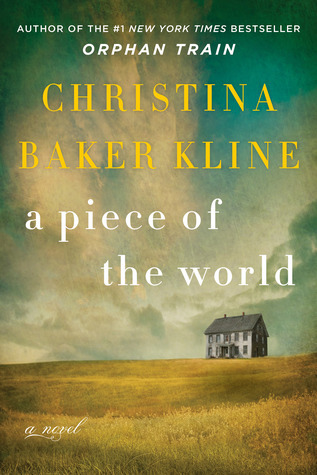 The story is based on the Andrew Wyeth’s 1948 painting, Christine’s World. I’ve enjoyed this leisurely read after last week’s high intensity read of Into the Water. I had hoped the story would focus more on the relationship between Christine and the artist rather than detailing her backstory, but I’ve enjoyed it nonetheless. While I’m not sure which book I will pick up next, I’m comfortable in knowing I have plenty of choices. June was a great book-bargain month. 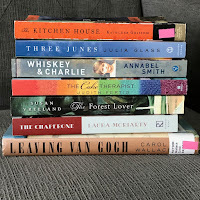 The local library held its annual book sale, where I scored a number of novels in my TBR pile in great condition. Leaving Van Gogh by Carol Wallace. I read The Last Van Gogh by Alyson Richman earlier this year, and I thought it might be fun to compare the stories. I am fascinated by this painter and someday may include him in my Travel through Art MG series. The Chaperone by Laura Moriarity. A few weeks ago a friend and I were in the bookstore pouring over several titles, deciding which one to read next. A complete stranger, yet friendly bibliophile, began a conversation with us and highly recommended several books. This was one of them. And the fact that the author lives in Lawrence, Kansas, makes the book even more intriguing. The Forest Lover by Susan Vreeland. I am completely unfamiliar with this title, but I am a huge fan of Susan Vreeland (my favorites include Luncheon of the Boating Party and Life Studies). This book focuses on the female modern artist, Emily Carr. While I am unfamiliar with her work, I know Vreeland’s words will transport me to another beautiful place and time. Whiskey and Charlie by Annabel Smith. I saw this book at Barnes and Noble on the “staff picks” shelf. While I don’t necessarily choose a book by its cover… I often choose a book based on the back blurb. This one caught my attention: twins, with their secret language, grow up and grow apart. When a tragic accident hospitalizes one twin, the other must consider life without his lifetime partner. Three Junes by Julia Glass. I actually saw an advertisement for the author’s newest work, A House the Trees; I was captivated by the main character – a children’s book author. Another avid reader and fellow book blogger commented that Glass is one of her favorite authors. I decided to start with this one, her first work, and see how I like her writing style. The Kitchen House by Kathleen Grissom. I am most nervous about this book. On the one hand, I love the idea of reading another historical fiction focused on Irish immigration to America. On the other hand, I’ve never been able to stomach reading about slavery in the South. The book has received some great reviews though, so I will give it a chance. So what do you think of my bundle? Any suggestions as to which book I should read first? I continue to plug away at various projects. I have a structure for Italian Family Christmas and a rough outline. Now to start writing the first draft. I found three more beta readers for Ellie’s Paris Adventure and I am anxious to hear their feedback. In the meantime, I will finish reviewing the text this week and begin making my revisions. Even though Journaling Toward Wholeness is now complete, I continue to research the topic and look for information to share. To that end, I thought it might be fun to provide monthly journaling prompts for those who might enjoy some assistance. While walking the basset (where I discover most of my creative ideas)… I came upon Polaroid Prompts. In essence, a means to combine my love of photography and my passion for journaling in a unique way. 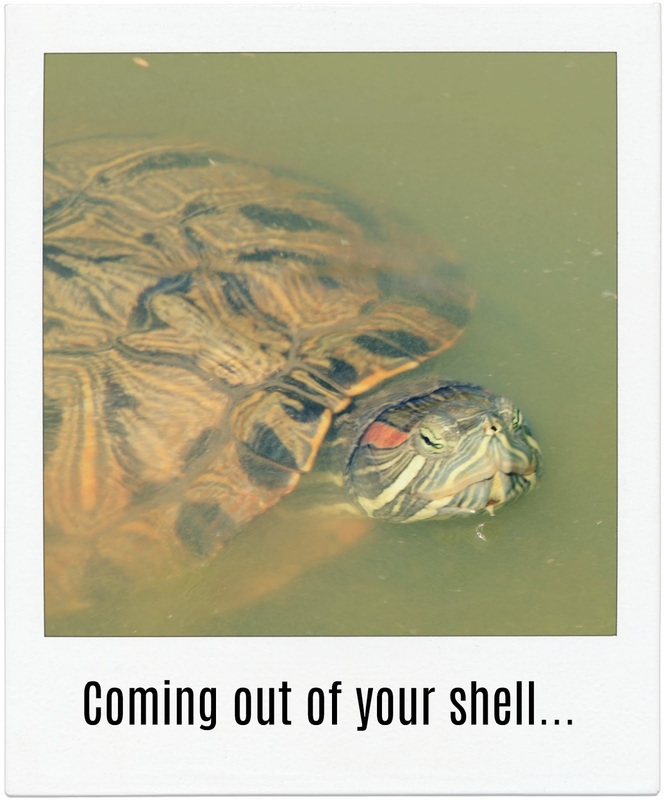 Some have turtles as pets. I did when I was around five… or I might choose to write about another beloved pet. Some have a fear of turtles. I don’t fear turtles, but I do fear snakes. I could write about that fear. Or I recall the singing group, The Turtles, and their famous song, Happy Together. I can write about the college Sigma Nu fraternity parties that considered that song its house tune. Anyway, you get the idea. Photos can take us back to the past and help us recall memories that would otherwise remain forgotten. What about you? How would you interpret this turtle prompt? You have so many fun ideas going! I'm not sure that I would get anything finished if I did. I think I'll look for Cake Therapist. Our local museum has a nice Wyeth collection so I'm really interested in A Piece of the World and am glad to see you enjoyed it. The turtle reminds me of the sea turtles we've been seeing while cruising in the Bahamas. It's so hard to take a good photo of them. For supposedly slow creatures, they sure do move fast in the water. First, I'm long overdue in thanking you for coming to Marmelade Gypsy and delighted to pay a return visit. 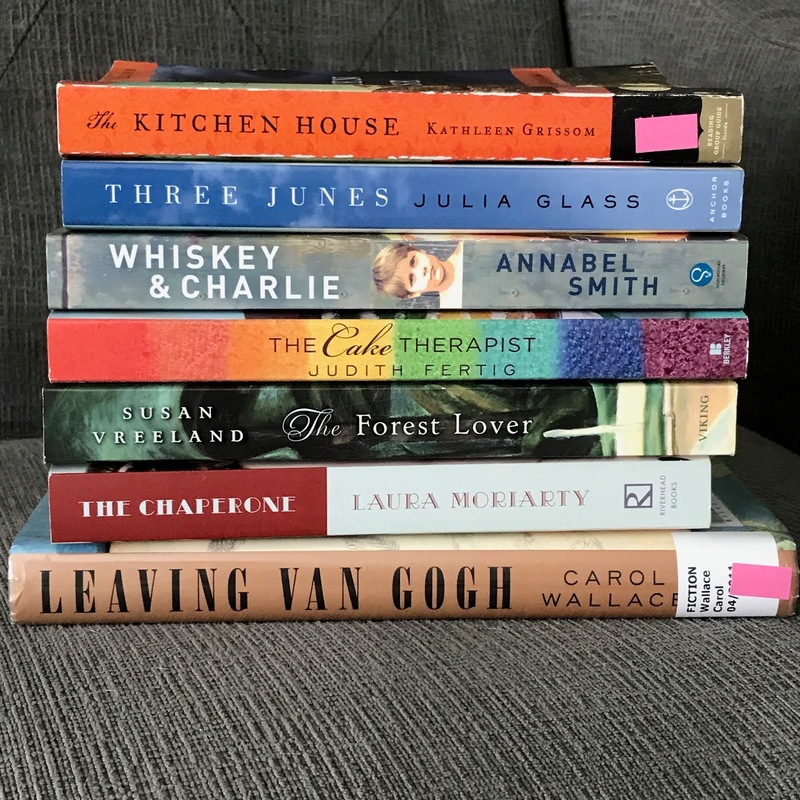 Don't you just adore library book sales? I've had some wonderful discoveries there. Looks lie you did, too! I think "The Chaperone" is scheduled as a feature film teaming up Downton's Elizabeth McGovern with its writer Julian Fellowes. What a good list! I am not very familiar with Wyeth's work, but after reading this novel, I want to learn more about the artist and his work. I totally agree! And the fact that the water is so murky doesn't make it any easier 🙂 Cruising in the Bahamas sounds WONDERFUL!! I LOVE Elizabeth McGovern (even before she appeared in Downton Abbey) 🙂 I will definitely be on the look out (and be sure to read the book before seeing the movie). I like Susan Vreeland books, too. It has been cooler here in the NW so I've been able to get outside and do some gardening. Today I was fighting with the wisteria.